I love it when I find something that is fun and inexpensive that can be used in many different ways and the colored marshmallows I wrote about last week are another one of those things! 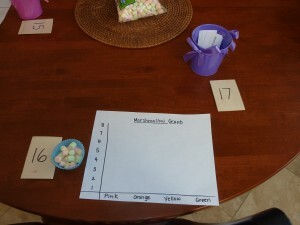 Here is a My Obstacle Course station activity to build the math skills of graphing and interpreting data with colored marshmallows. This is something that is great because each time you set it up, the results are different. I find that introducing a skill but using different materials that are random really helps to keep Andrew engaged and he learns about the concept and how to apply it with different things. When I was teaching, I always felt like graphing was a bit too abstract, throwing children into interpreting data from a graph without really knowing where the data is coming from. Depending on the school or teacher, there may be more emphasis on providing opportunities for children to graph things that the they can relate to but an activity like this really allows them to be part of the process from start to finish, being able to move and place each item where it belongs and then answering questions. For this station activity, I used a sheet of white printer paper to make my graph, placed some colored mini-marshmallows in a muffin cup and provided some follow-up questions to help build math vocabulary and work on analyzing the data, aka marshmallows. When at the station, place the marshmallows in the correct row according to their color. Some children will dump the marshmallows out and then place them randomly. Andrew favors doing it one color at a time. 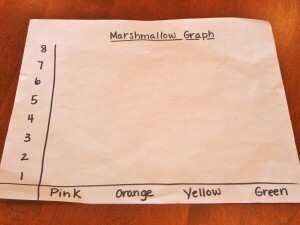 When all of the marshmallows have been placed in the correct row, the graph is complete. I like to talk a little bit about what we notice – Which color have the most? Which color has the least? I also use the question strips that I made for marshmallow sorting. (marshmallow questions) I cut them apart and place them in a bucket so he can pick one question at a time instead of being overwhelmed with a whole sheet of questions. Small thing to do but it makes a huge difference in attention and motivation. Another simple and easy way to build math skills using something fun, easy to find and inexpensive :).